Awesome! Thanks Martin! It’s really the one collection I keep coming back to. The El Bulli books are great, but can be a little obtuse. Texture is by far the most detailed and comprehensive. 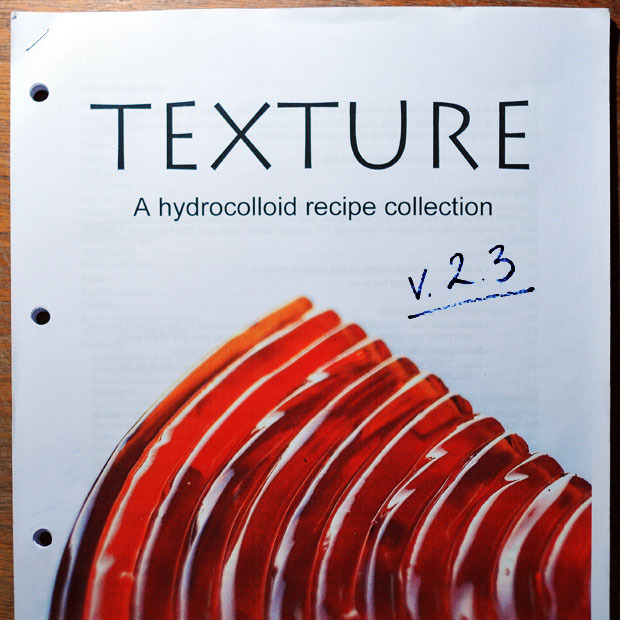 Great work on the collection, its great to have an overview of these ingredients and examples of there applications, Texture has become an important part of my reference material! thanks for sharing! Thank you! Funny enough, the last version we used at Ferran Adria’s Alicia Fundacio for workshops in modern textures & gastronomy. I must forward this to my former colleagues: Pere Castells & Ingrid Farre, of the el Bulli family. Give me some time to absorb the new additions….. Molte gratis! Hi I have designed a Molecular Cookery course that I will run in January at West Kent College. I have been put on your work by a great Chef that i have been doing some workshops with at his Kitchens. I would love to try out these recipes with my students and post pictures and give you feedback. I teach Catering and the student will start in September. Please let me know where I can post this information etc. i am also on the look out for guest speakers to demo stuff and talk to students would you be intrested in that tpye of stuff?